Three Bridges’ music is rooted in traditional Gospel, southern gospel and a touch of soul music. This blended style has made Three Bridges an internationally-acclaimed Gospel group — one that is known for tight harmonies, a unique vocal style, an exciting and energy packed stage presence and, most importantly, for spreading the joy of the Good News of Christ. 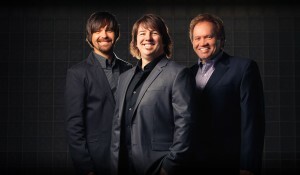 They have entertained and ministered to millions through their recordings, TV appearances and live shows — which is why Three Bridges has quickly become one of the most prominent Gospel groups in Christian music today. Following the release of the critically-acclaimed debut album, Soldiers (2002), Three Bridges has wowed packed-out venues across the nation…from Gospel concerts, business conventions, TV shows, and all the way to having their music played on Air Force One ! They have receiver over 30 Award Nominations such as….